Improve Your Craft From Home with this Webinar! Verse Novels 101: What are they? Thinking about writing a verse novel? Have a verse novel in progress but aren’t sure if you’re on track? In this 90-minute webinar, you will learn the basics of writing verse novels. Author Kari Anne Holt will discuss what verse novels are and why they’re so popular with young readers (and their gatekeepers). We’ll talk about how exactly you build a story using poetic elements, and why you’d want to in the first place. We’ll even delve into structure, pacing, word choice, and why sometimes the words you don’t choose are the ones that make your story sing. We’ll also have plenty time for Q&A throughout, so you can ask specific questions about your current (or future!) projects. 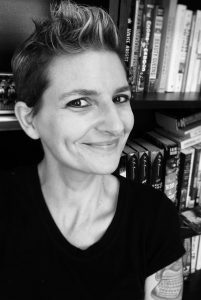 Kari Anne Holt is the author of several middle grade novels in verse including the newly released Knockout, and House Arrest, winner of the 2018 Nebraska Golden Sower Award, the 2017 Mississippi Magnolia Book Award, and a 2015 Nerdy Book Club award for poetry. Her novel in verse Rhyme Schemer is an Amazon Best Book for Kids and Teens, and a Bank Street Best Book of the Year. She has also published several middle grade fantasy adventures, including Gnome-a-geddon, Red Moon Rising, Brains for Lunch: A Zombie Novel in Haiku! ?, and Mike Stellar: Nerves of Steel. Kari Anne’s debut picture book, I Wonder, illustrated by Kenard Pak and published by Random House Books for Young Readers, will be released in 2019. Kari Anne lives in Austin, TX and eats a lot of tacos. This webinar will be recorded, but you MUST register BEFORE the webinar to view the recording. Registered attendees will be able to view the recording for 1 month after the webinar date. The webinar costs $10 for SCBWI, $35 for non-members. SCBWI members, login to get the discounted price. If you aren’t a member, click here for more information on the many benefits of being part of our community. LOGIN INFORMATION for the webinar will be emailed to registered attendees AFTER 3PM on Oct. 23. Kari Anne has also offered to do a limited number of written critiques of the first 10 pages of a novel in verse after the webinar. Critiques cost $35 and are NOT included in the webinar. If you would like a critique, choose that option when you register below. Critique pages must be submitted during the week between Oct. 30 and Nov. 6. This gives you time after the webinar to revise based on what you learned. Written feedback from Kari Anne will be emailed to you within 2 months. See our webinar critique guidelines for more information on submitting pages.